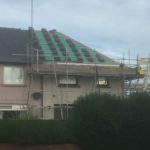 The quality and breathability of Roofshield is helping to deliver significant savings in time and cost to a series of sea facing properties in the North-east of England. The 35 semi-detached homes at Sea View in Berwick form part of a wider programme of housing stock upgrades being carried out to over 200 homes across the region by Bernicia Homes. Matt Rowley, Operations Director for contractor Springs Roofing, comments on the reason for selecting the roofing membrane solution from A. Proctor Group for the project: “When the initial exploratory examinations were undertaken we identified that the roof structure was fully boarded and that the original specification for a traditional membrane would not have worked without the need for additional roof vents. Roofshield was selected because of its superior quality and breathability. It has an extremely high degree of vapour permeability, as well as air permeability, without the need for additional ventilation. The roofing membrane features a patented SMS (Spunbond Meltblown Spunbond) structure, which allows high levels of airflow, in addition to the transport of moisture vapour, making the formation of condensation in the roof space virtually impossible.